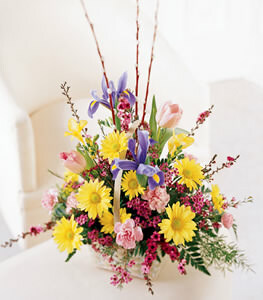 The perfect introduction for new neighbors or colleagues, this arrangement brightly embraces fresh adventures. A great gift for any welcome occasion. We received the above flowers at the Terra Mar Grille at the Saybrook Point Inn & Spa on schedule. The Florist you used did a wonderful presentation and we could not have been more pleased. We will use your services again in the future. Thanks again. Hi, I just want to thank you for your amazing service and the beautiful flowers. My boyfriend loved it. Im surely going to order from you over and over again. Thanks so much! Copyright © 1999 - 2019 flowerpetal.com, an online florist. All rights reserved.